A frog species which had a distinct Norfolk accent, but which became extinct in England in the 1990s is being reintroduced. About 70 northern pool frogs - one of Europe's rarest species - will be reintroduced to Norfolk by English Nature and partners on Friday. The frog was thought to be a European import, but researchers have now found they are native to East Anglia. Recordings of mating Norfolk frogs show they had a characteristic inflection. Archaeological investigations revealed pool frog remains around old Saxon sites in Cambridgeshire and Lincolnshire. But fenland drainage led to the frog's extinction before its native status was recognised. 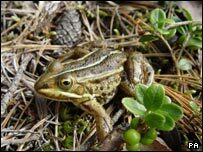 The pool frogs released on Friday were captured in a wildlife rich region in Uppsala in Sweden earlier this week. The frogs will be released at a secret location near Thetford in Norfolk, to guard against theft by amphibian collectors. Habitats at the site, including special ponds called pingos, have been restored by the Forestry Commission over the last few years. English Nature's amphibian specialist, Jim Foster, said: "Piecing together what happened to pool frogs has proved to be a real detective story. "The frog's distinctive Norfolk accent, the buried remains and genetic studies all provided crucial clues. "It has taken nearly 10 years of research, involving people across Europe, to get to the bottom of this mystery and today is the culmination of all that effort."